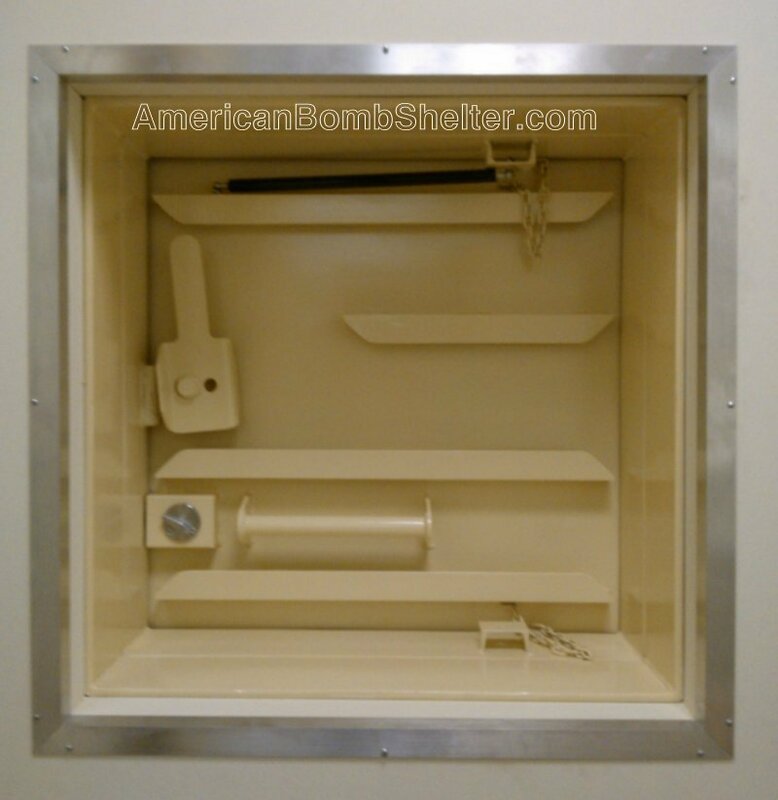 American Safe Room manufactures the best blast hatch you can put on your safe room or bomb shelter. 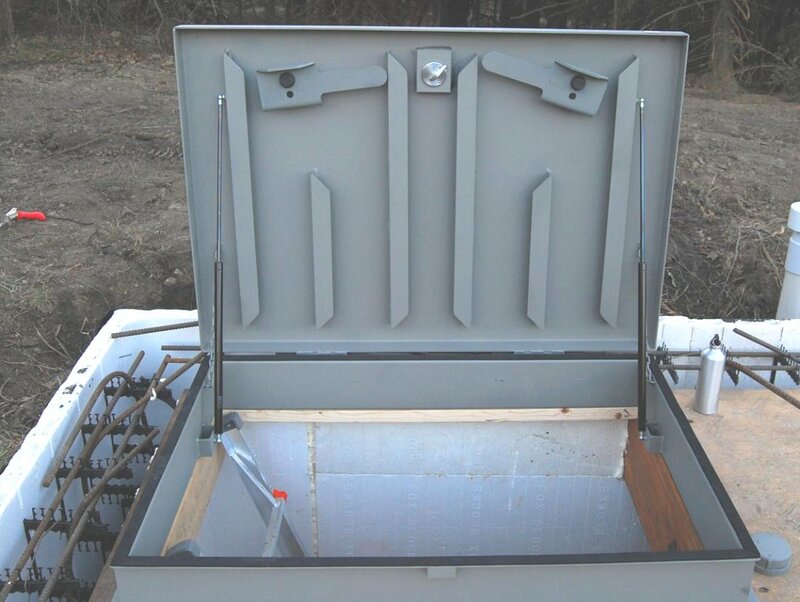 It is a “flat” hatch, compared to our riser hatch, which features an integrated riser that can be ordered in custom heights to match the backfill depth of the shelter. 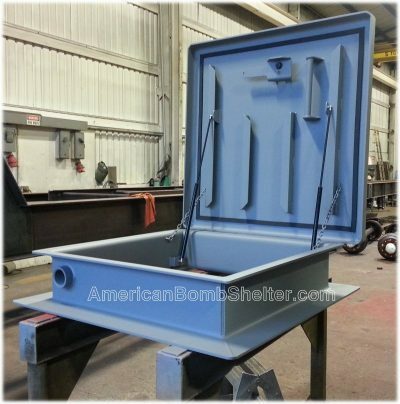 This hatch is designed to be bolted down onto a shelter top with included concrete wedge anchors or welded to a steel shelter. It features crisply punched mounting slots instead of round holes to allow movement in two directions for easy positioning on the anchors. 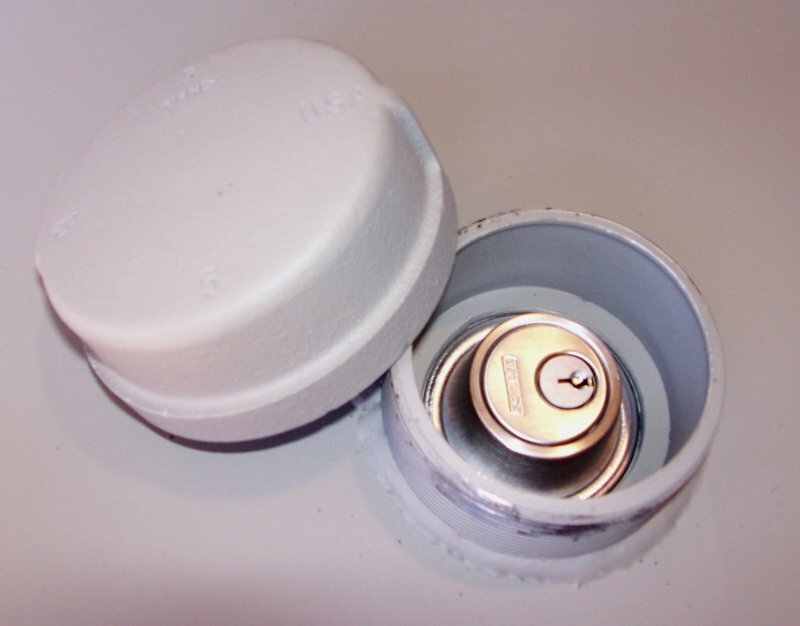 The inner cam latch is the same one we use on our blast doors. It draws the blast lid downward, compressing the EPDM seal on the frame lip and drawing the rain lip down over the riser. Note the deadbolt lock, the pull handle, the lift strut, and the other lift strut anchor so you can mount the strut on either side. 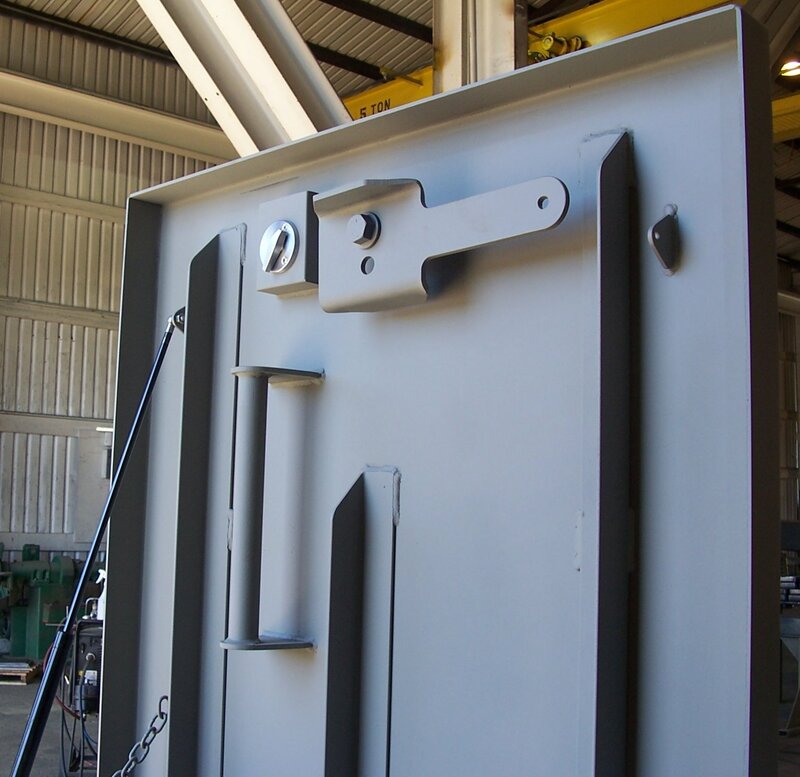 The massive hinge assembly is the same one used on our blast doors. It features an inch and half steel pin, bronze bushings, and grease zerk’s for ongoing lubrication. 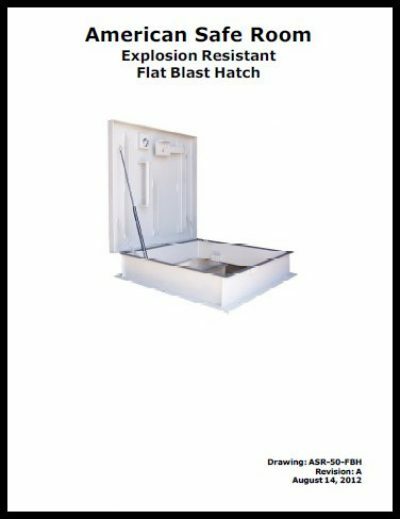 The flat hatch can be supplied with a UL fire rated wide angle viewer strategically mounted on each of the four walls. They are mounted six inches below the hatch lid. This gives you the ability to see what is directly around your hatch before opening it. The viewers are mounted in heavy duty inch and a half round steel rods that have been bored out, leaving three-eighths wall thickness. These mounts are inserted through the side wall of the riser and welded in place. 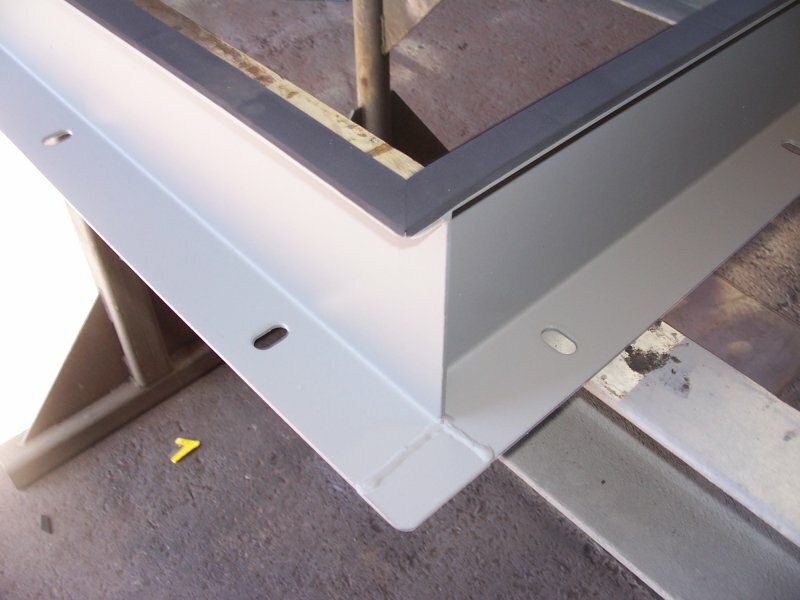 When the viewer option is chosen, the height of the flat hatch increases by two inches. See the manual for more information. This 3 ton bottle jack can be deployed if debris falls on top of your hatch. In the stowed position, the top anchor is removed and it rotates down to nest behind the internal ladder. It must be rotated up into position before use – but you do not have to climb a ladder with a heavy bottle jack to affect emergency egress. The red jack is shown here in the deployed, extended position. 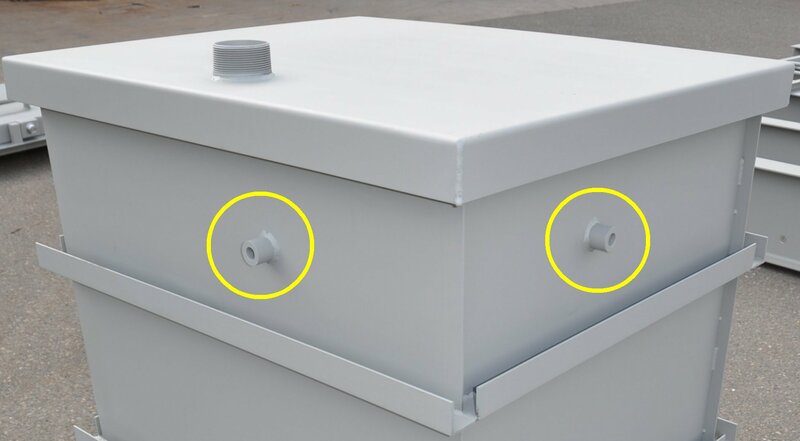 On the flat hatch, the installer must locate and install the bottom jack anchor on a wall directly underneath the hatch. See the manual for more information. 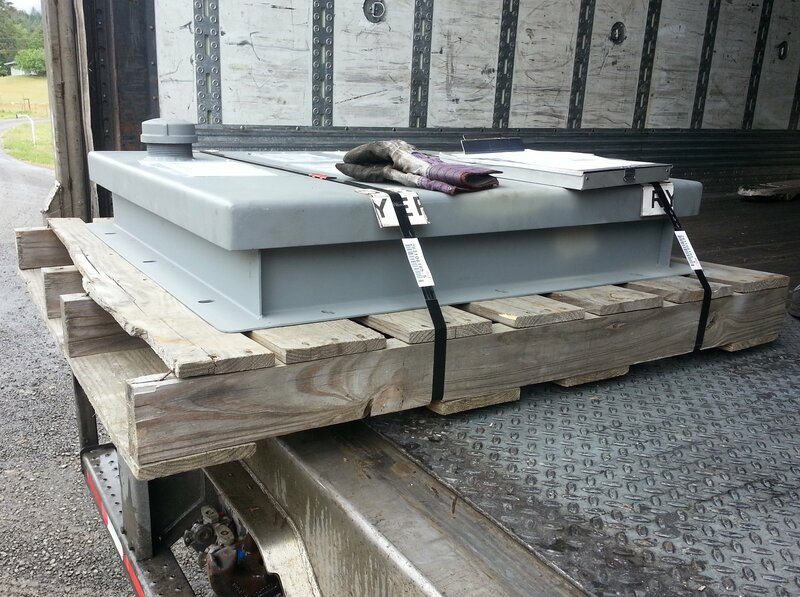 The hatches are shipped by LTL freight. We can specify that the delivery truck has a drop gate so the delivery is on the ground exactly where you want it. You must ensure that there is adequate turn around room. 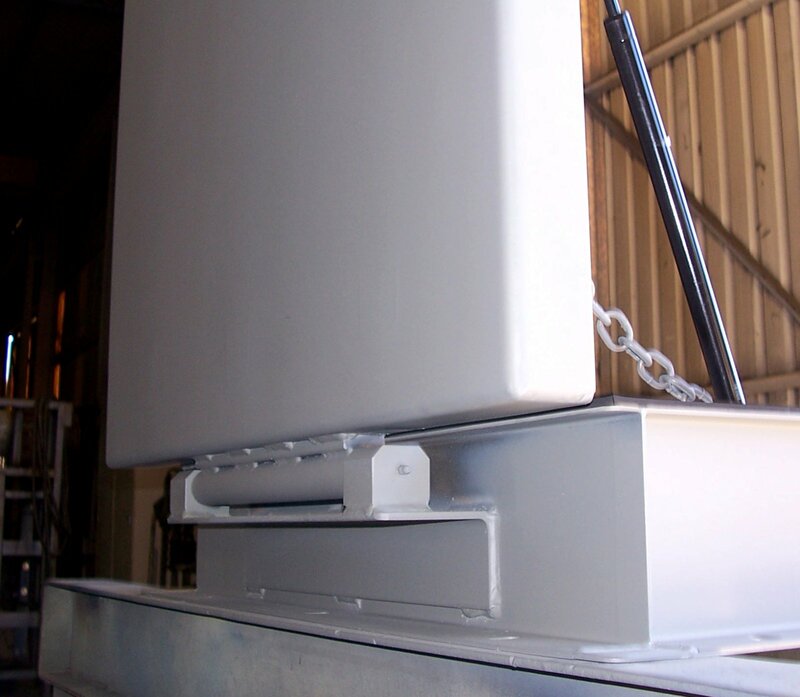 We size the lift struts to provide an easy opening – see the short video. Note how he has to lift the lid initially and then the lift struts take over. The lift struts also keep the hatch open at just over 90 degrees. 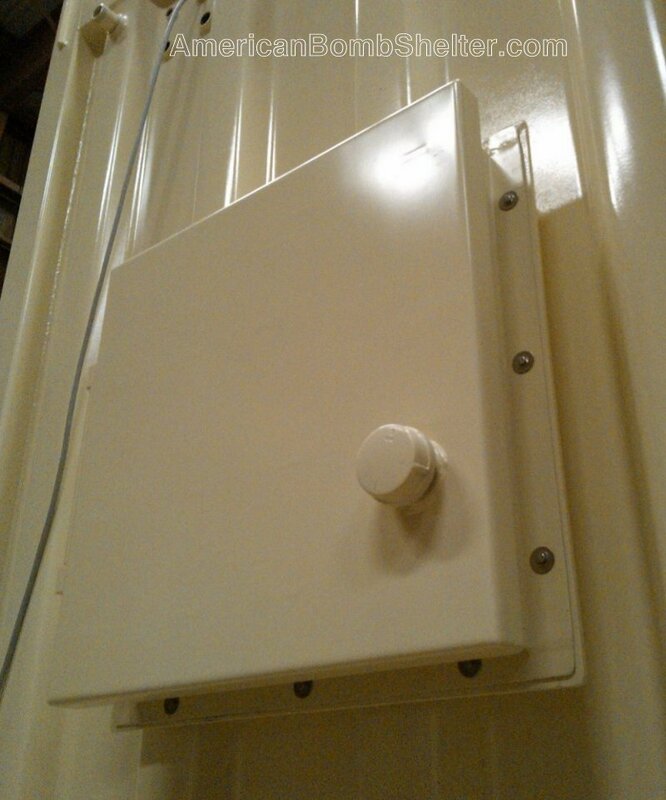 This is a flat hatch used as an emergency egress point in a refuge chamber for an offshore oil platform. They mounted it on a corrugated vertical wall. Above is the outside, below is the inside. Painted yellow and installed with some aluminum angle trim strips. A nice installation. 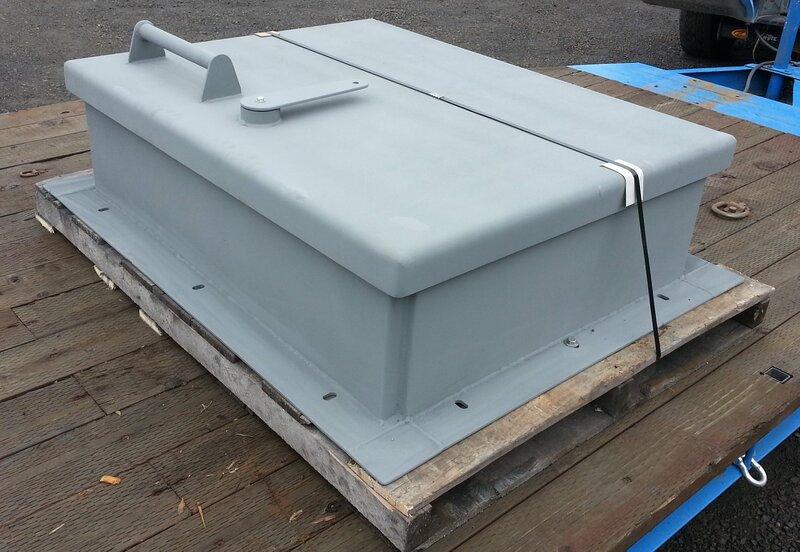 This is a hatch we built for roof access of a high security facility. The customer wanted to locate and drill their own fasteners holes in the mounting flange and they had a pipe that needed to come through the wall of the frame so we welded in a threaded pipe coupler. The blast lid as well as the frame were fabricated from 3/8 inch ballistic plate to give UL 752 level 8 protection (must withstand multiple shots with 7.62 NATO ball). We used our hydraulic press brake to form the channel section frame and the rain lip on the blast lid. We used two lift struts and since it was a roof access hatch, there was no need for the deadbolt lock. 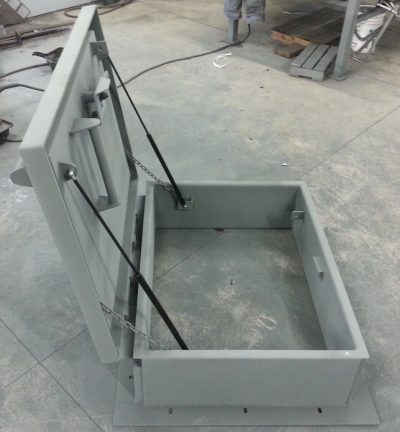 The hatch is secured inside with one of our heavy duty rotating cam latches. This is a hatch we built for roof access of military facility. We designed it to their specifications and submitted a drawing package and a set of UFC-03-340-02 calculations stamped by a professional engineer. After they approved our design and calculations, we started fabrication. The sides of the frame and the blast lid were all double wall construction with insulation between the walls. 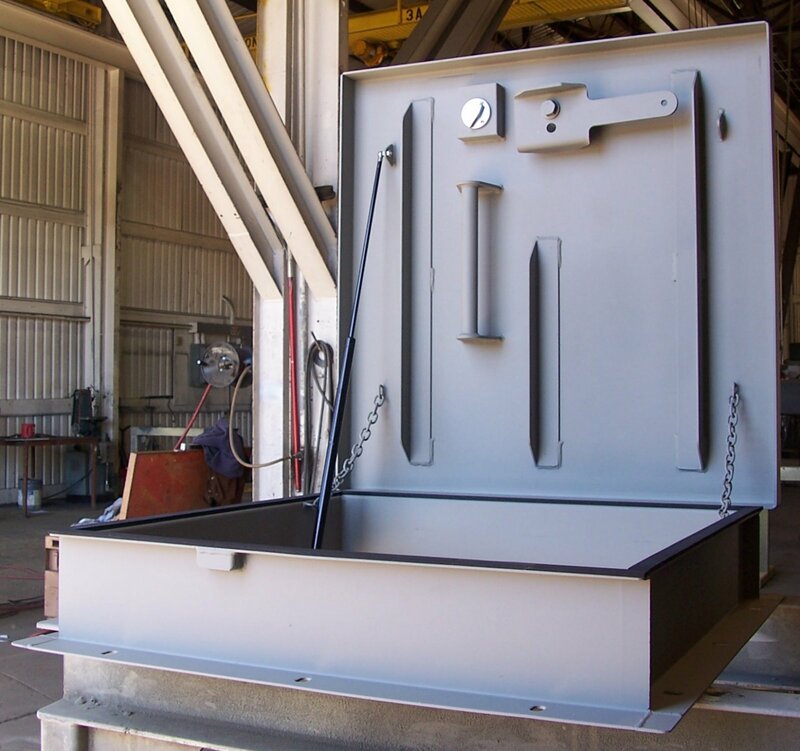 We used two lift struts and since it was a roof access hatch, there was no need for the deadbolt lock – but they wanted an outside operator so the hatch could be shut while workers were on the roof. The outside operator is connected to the inside cam latch by a shaft that is captured in a steel barrel with bronze bushings and a grease zerk for ongoing lubrication. We built this special long hatch as a custom job several years ago and people keep seeing the picture and ordering them. We hold the 32 inch depth dimension and lengthen the width to 48 inches. This allows for a shallower angle on the ladder and makes it easier to get stores into your shelter. The hardware is two hinges, two cam latches, two lift struts, and one deadbolt assembly. Note that we’ve moved the seal from the frame lip to the hatch lid on all of our hatches since we made this hatch. This keeps it from getting scuffed off when people climb over the frame. The other custom hatches above show the seal on the hatch lid.